This is write-up by Teen Leader, Claudia Garcia. Thank you, Claudia! 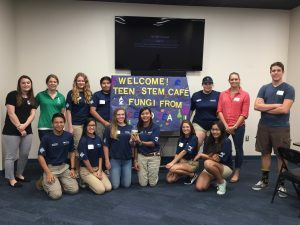 On October 2nd, Texas State Aquarium in Corpus Christi held a Teen STEM Café with presenter Dr. Brandi Reese from the Department of Life Sciences at Texas A&M University Corpus Christi. She came in and talked about deep-sea fungi and how it made a trip into space. Dr. Reese studies fungi that live in extreme environments. While researching samples of bacteria brought from the deep sea, she discovered a new species of fungus! This fungus was then sent off for experiments to the International Space Station and then brought back 4 months later. Throughout her presentation, Dr. Reese explained the structure of a fungus and how the one she discovered could be of help to researchers in the healthcare field. Some of the fungi that she discovered belongs to the genus Penicillium, which can help produce the antibiotic penicillin. She also gave details of what happened to the fungus on the space station and how they continue to study its DNA now that it has been brought back down to earth. 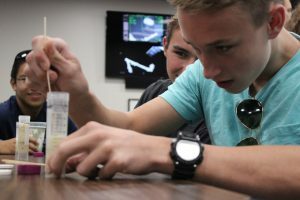 The students were also able to get a close look at the fungus Dr. Reese had recently launched into space. Many of these students were in awe of Dr. Reese’s discovery, and she was more than happy to answer any questions that the students had concerning fungi and their reactions in the different extreme environments and on earth. Students make their own fungi DNA. During our hands-on activity, the students were able to extract DNA from wheat germ and yeast. Dr. Reese and her students from Texas A&M also assisted the teens from the café during their experiment. Within minutes after shaking all of the ingredients together the students began to see a white foam develop, which was the DNA that was extracted.